did a drawn map of my old neighbourhood and jogging route. relied on google maps for accuracy. Maybe a map drawn from memory would have been cooler.. This so far is my sketch of my neighbourhood. The little red dots mark my favourite places. The outlines are the ones on the actual streetmap. Maybe I'll lose some detail to make the map prettier? I had one of those recycled envelopes at hand that have old maps as inner lining and I used that. It did not really look amazing and the contrast to the white paper as background was not enough to make it pop. so I chose a magazine page with a photo of blue sky on it and used that. i thought this would be nice for a holiday map to show the shortest way to the beach or something. then I drew out the outlines of my neighbourhood and cut away everything but the streets. 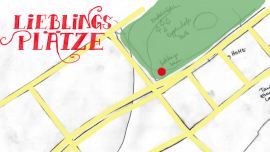 If you are in need of a map to guide you quickly to a place for coffee/cakes or the park, this way I can guide you fast. There can however only be one point of interest per block of space.